No matter what the message you want your décor to communicate; Office Furniture Concepts offers a wide selection of contemporary office desks and affordable office furniture sure to provide your business with the right stylistic message. Spanning the range from cool, modern and chic office furniture to the classic, traditional and elegant styled veneer and laminate, contemporary office desks Office Furniture Concepts strives to provide all your business furniture needs. Product coming straight from top manufactures in office furnishings such as Global, Whitehall Furniture, Cherryman Industries, and The Mayline Group lets you know that the merchandise is durable, functional and versatile. The heart of your office space rests on the top, table top that is. Let Office Furniture Concepts help you sturdy the foundation of your business with a large, available selection of contemporary office desks. Making your dollar go further is sometimes as easy as simplifying the means by which its used. Purchasing from Office Furniture Concepts means you will get the best business office furniture, at the best price and with the most simple and effective process. Whether you need heavy-duty office furniture or executive office furnishings Office Furniture Concepts offers a vast selection of office apparatus all of which is available throughout our site. Contemporary office desks are offered in various styles and that will to assure that the meet the multiple needs of your business are met. From training room furniture to conference room chairs and executive contemporary desks Office Furniture Concepts has the basics, the essentials and even some of the perks. We can fulfill any office furniture needs from our wide range of affordable office furniture for any budget and for any business. If durability and price are your hot buttons, we have what you need. We offer a large selection of laminate office furniture desks from name brand manufacturers such as Global, Offices to Go, Mayline, DMI Furniture and Cherryman. Many configurations and colors are available. We offer Free space planning! Please contact us directly at 888-632-8480 to plan your space! Our wide selection of laminate office desk includes a variety of office furniture, workstations, and office furniture and computer desks. These contemporary office desks and modern business furniture are practical for your employees that who use computers and other productivity increasing machines for your business. Our office furniture will greatly aid in the productivity of your business while allowing you, as well as your employees, to maximize your budget and select and utilize the best laminate office furniture around. But don’t look too far, because we have it. This selection of office furniture ranges from the cool and contemporary to ergonomic office furniture and into the classic and elegant office furnishings that are sure to customize any work space. The veneer and laminate, contemporary office desks from top manufactures will provide the necessary frame needed to drive your business to where you want it to go! Office Furniture Concepts offers global office furniture that carries many high-quality, value-priced, wood veneer covered, contemporary office desk series. The selection includes from name brand manufacturers that produce business office furniture such as Global-Offices To Go, Mayline and Cherryman. When you buy office furniture with Office Furniture Concepts you can feel reassured that you are receiving the best products that are stocked for quick delivery nationwide. 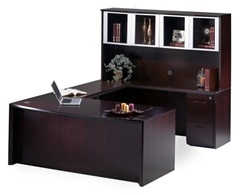 Our selection of wood contemporary office desks, finished in veneer office desk and furniture fits any budget. All our office furniture and is of the highest quality, ensuring that whatever you buy will meet your value needs. We also deliver our product quickly and securely to your location. is of the best quality and is quickly and securely delivered to your place of business. We’re making you better by serving you better.